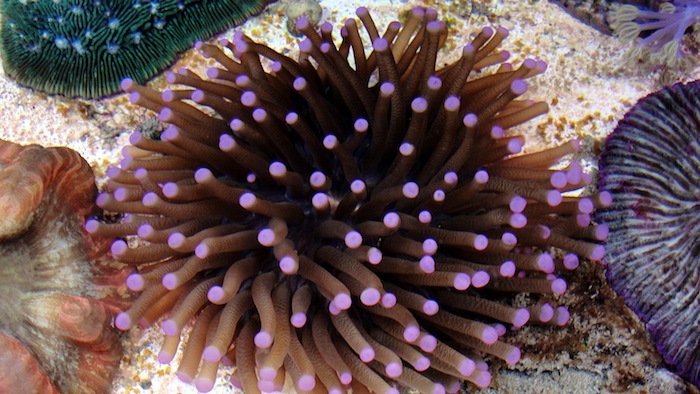 The Long Tentacle Plate Coral (Heliofungia actiniformis) is a stunning, active coral capable of adding a splash of color and movement to any reef display. 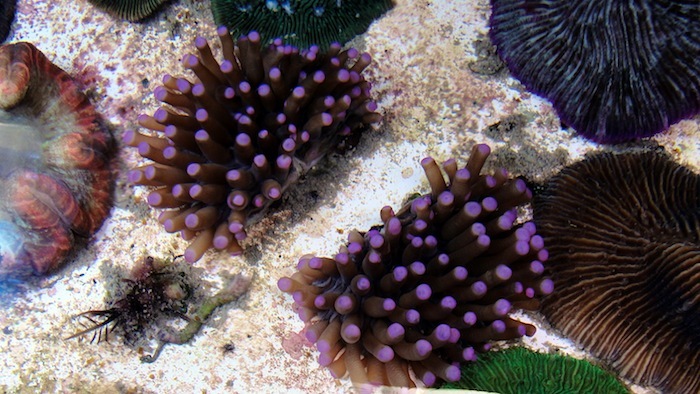 Although notoriously intolerant of tissue damage, Heliofungia has become a popular, sought after coral in the reef aquarium hobby. About two years ago, I was prowling my local fish stores in search of a suitable host for my Percula clownfish. 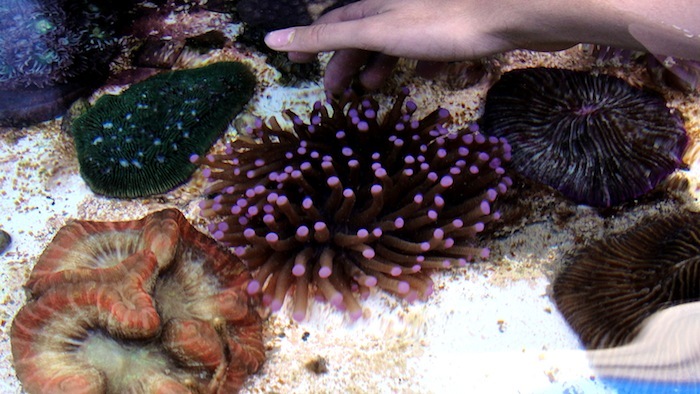 I decided against an anemone because of their motile tendencies and inevitable reproduction. Just before succumbing to yet another Euphyllia purchase, I stumbled upon a wide variety of Heliofungia. Bearing no more than a wrinkly fifty-dollar bill, I picked one out. 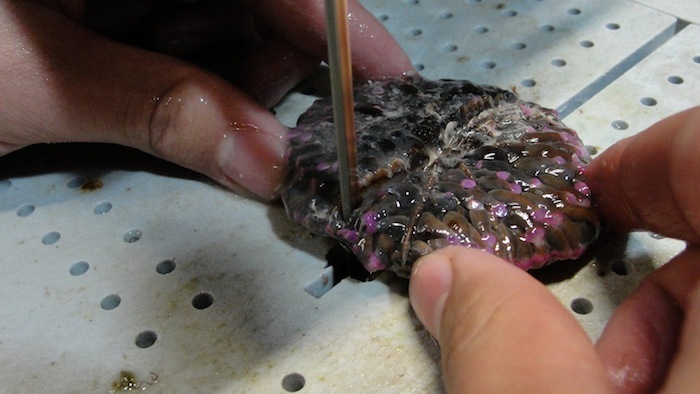 The next morning, the seemingly small Heliofungia displayed incredible polyp extension, smothering various corals and giant clams. To accommodate this behemoth of a coral, I immediately rearranged surrounding corals, clams, and live rock. 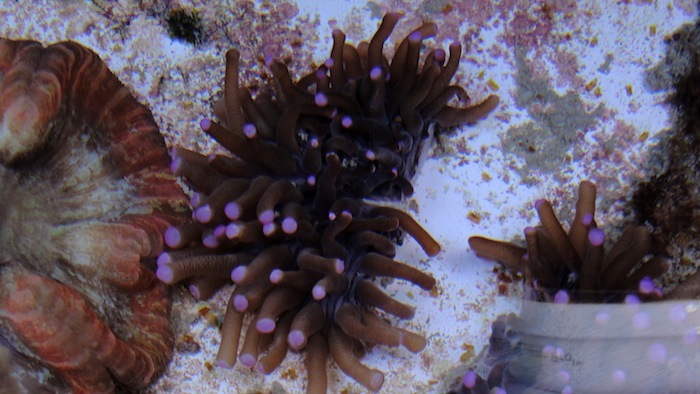 As my tastes in corals began to change, and real estate in my 24-gallon reef became sparse, it was time for the Heliofungia to go. Rather than returning it to the fish store from where it came and receiving minimal store credit, I decided I would bring it to Atlantis Marine World, the aquarium where I have been spending my high school years as an intern. Months later, after the Heliofungia settled into Atlantis’ coral propagation system, I figured it would be a good idea to try propagating it. Over the years, I’ve read in literature that Heliofungia is far less resilient than otherFungiid genera as far as flesh wound recovery. This notion only piqued my interest, and encouraged me to attempt such a feat. Although I had heard of many people failing, I believed that with proper care and instruction, it could be done. 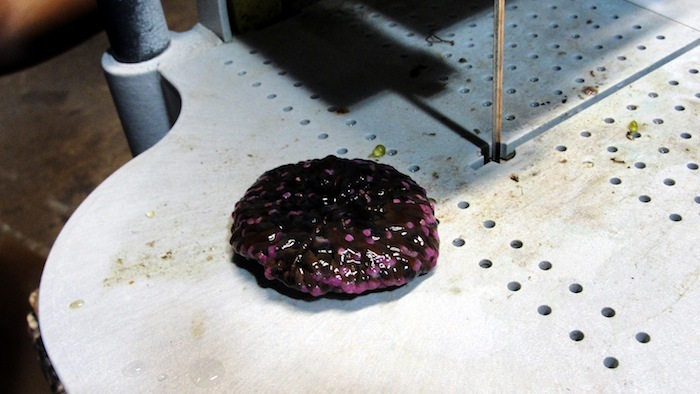 Considerations When propagating a large stony solitary polyp, it is crucial to minimize heat transference between the source of friction (propagation tool) and the polyp. 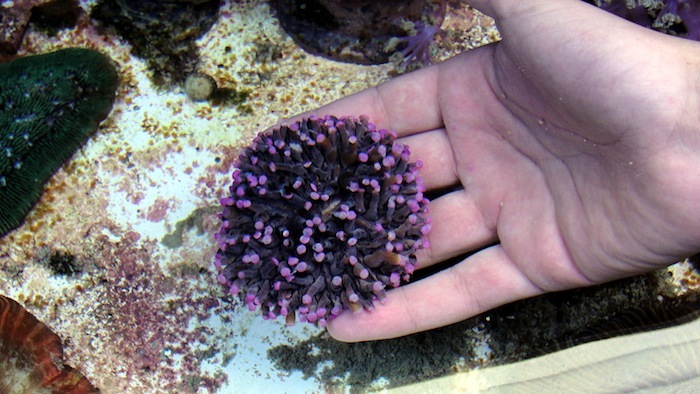 If the polyp absorbs too much heat, it can easily become susceptible to rapid tissue necrosis. This being the case, I decided that a diamond band saw would be the best-suited tool for the job. Not only does the diamond band saw provide a quick, clean cut, it also drips water onto the subject, cooling it down to eliminate the heat resulting from friction. Propagation First and foremost, the Heliofungia was forced to retract by hand. This reduces contact between the blade and the coral’s sensitive tissue, minimizing damage and stress on the coral. After a few minutes of running my hand through its tentacles, it had fully retracted and was ready for the incision. The cut was made perpendicular to its mouth. This allows the mouth to recover more quickly so that both halves can obtain nutrition by catching and consuming prey items, aiding the recovery process. Just to be proactive, a solution containing 40 drops per gallon of Potassium Iodide was made. The halves were placed in this solution for 12 minutes. This was done to reduce the chance of infection, which could potentially lead to necrosis. 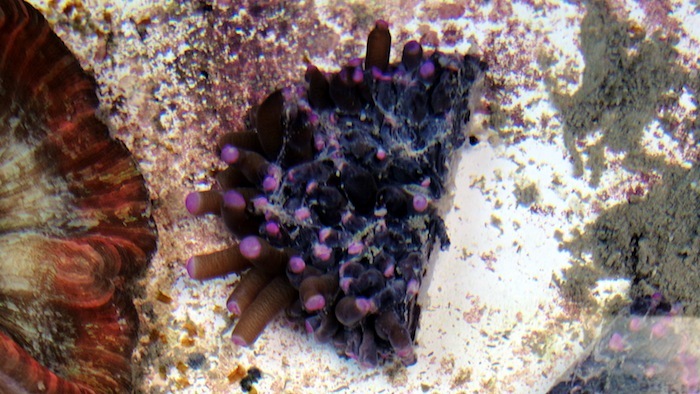 Just hours after propagation, the Heliofungia was already beginning to display polyp extension. One week later, the Heliofungia was fully extended and accepting food. As of one month after the division, the Heliofungia has healed over the incision and is slowly regaining skeletal mass. 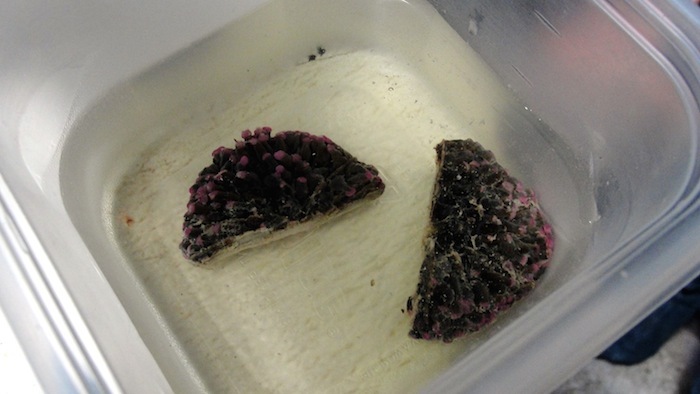 Although widely considered a sensitive coral, Heliofungia had proven itself to be incredibly resilient throughout the course of the experiment. On more than one occasion, the fragments seemed as if they were on the brink of death, but were persistent in survival nonetheless. 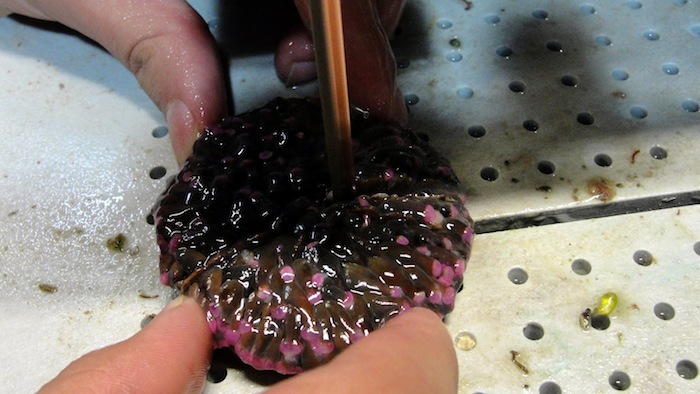 When executed with proper equipment and knowledge, propagating Heliofungia is a reasonable way to replicate such a beautiful coral, and may even find a foothold in the aquaculture industry.